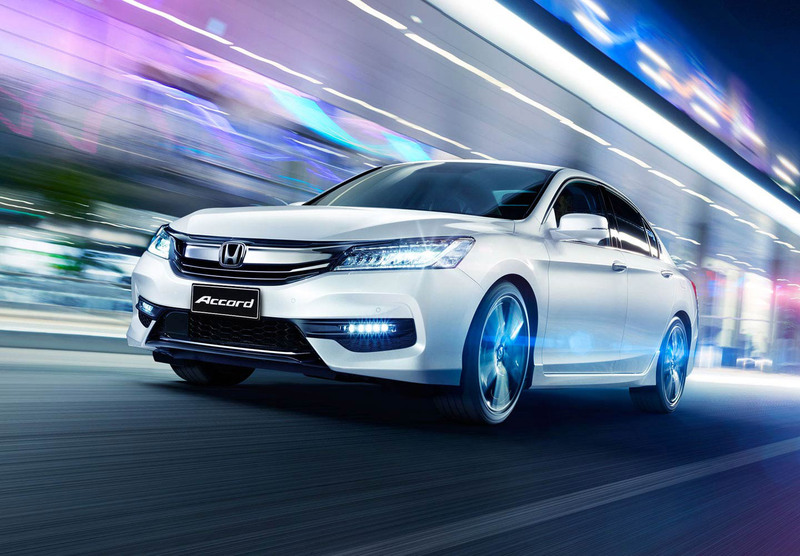 With a distinctly sporty look, the Accord capitalises on the relaxed luxury of its predecessor. Inside, the latest in technology puts you in command, while highly evolved safety features help you monitor your drive – and the world around you. And that’s all to start. With so many features, details, pleasant surprises, ‘thought-of-thats’ and more, you’ll quickly see why the new-look Accord truly has it all. Welcome to the future of lighting. With distinctively-designed LED headlights and Daytime Running Lights (DRLs) as standard, you'll enjoy a brilliantly lit road ahead. 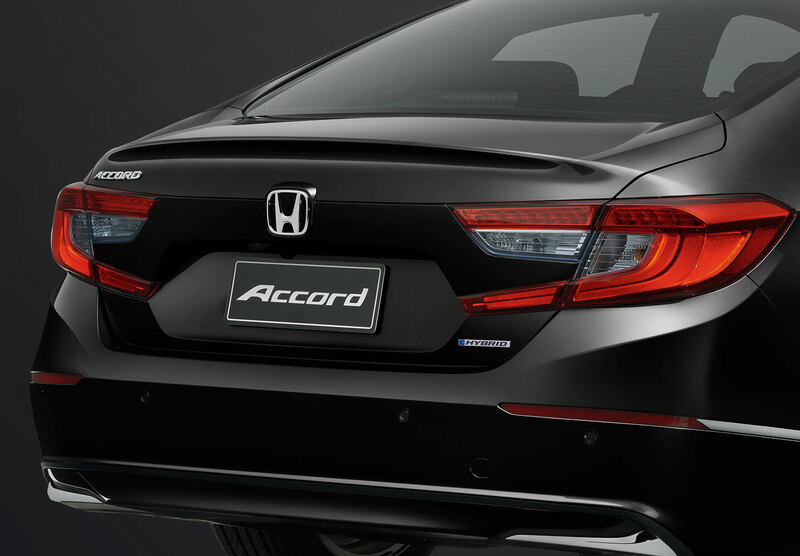 At the rear, beautifully designed tail lights with integrated LED light bars help give the Accord a unique persona. 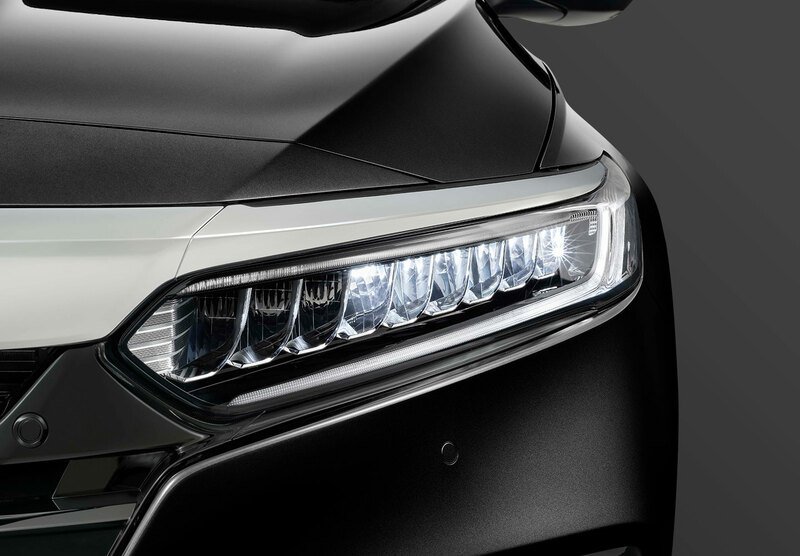 A pair of LED fog lights enhance the look of the front grille whilst also offering a desirable safety benefit. Handsome and intelligent. 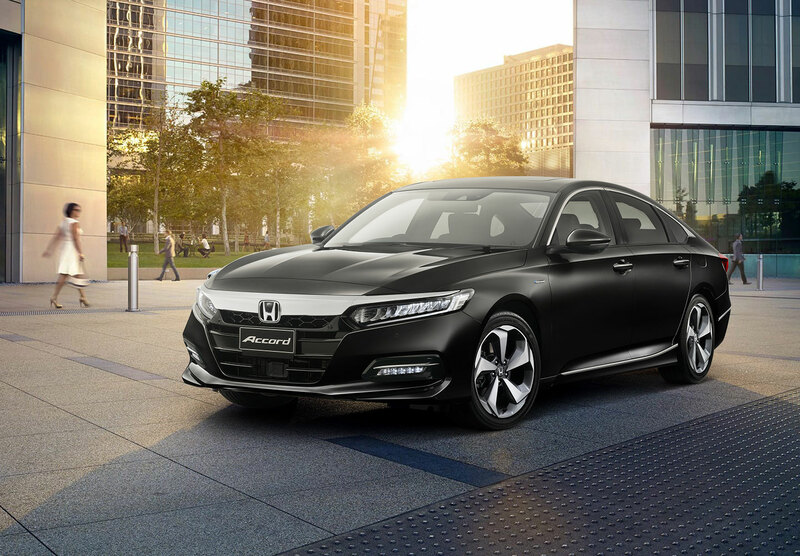 The Honda Accord brings a new height of sophistication to a vehicle that lets you have it all, without compromise. 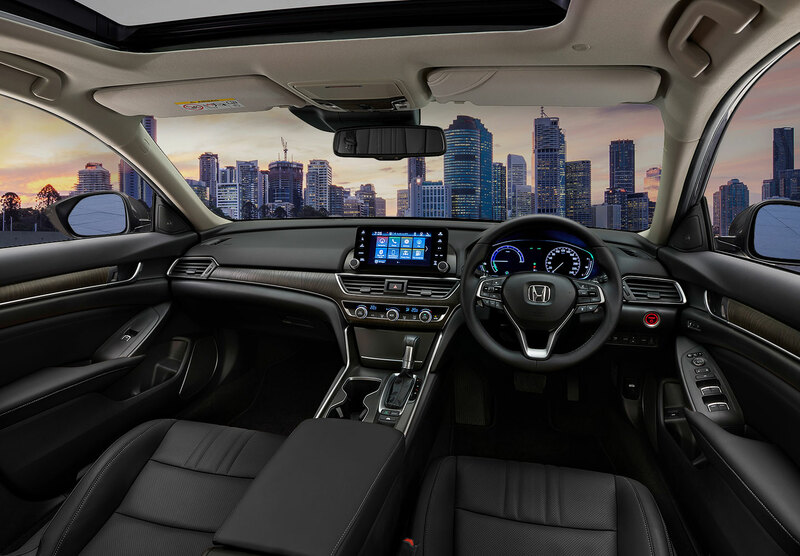 With a distinctly sporty look, the Accord capitalises on the relaxed luxury of its predecessor, while providing superior space and comfort. The Accord’s dash has been redesigned with practicality in mind. The centre console boasts dual screens – up top, a colour intelligent-Multi Information Display (i-MID) shows your audio and phone information along with a huge range of other features. 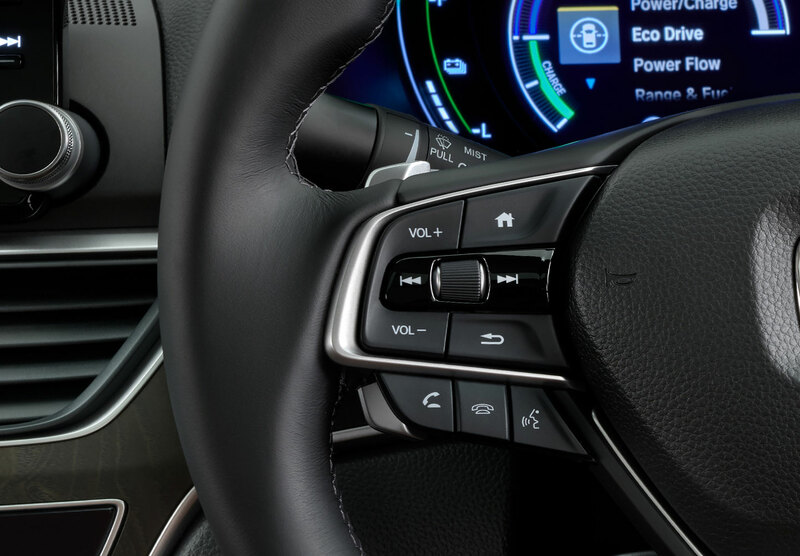 Beneath it sits Honda’s Advanced Display Audio unit, eliminating button clusters with its sleek, simple design and easy-to use on-screen controls. Every tiny detail is catered for. 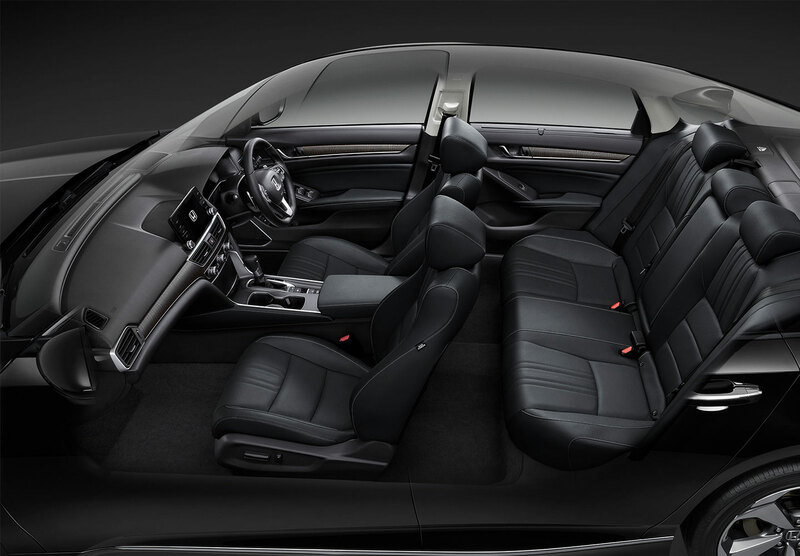 More legroom ensures maximum comfort along with power adjustable heated front seats and electric rear sunshades. Premium finishes and quality materials make driving a first class experience. Its sleek lines and powerful stance is further enhanced by striking new alloy wheel designs. 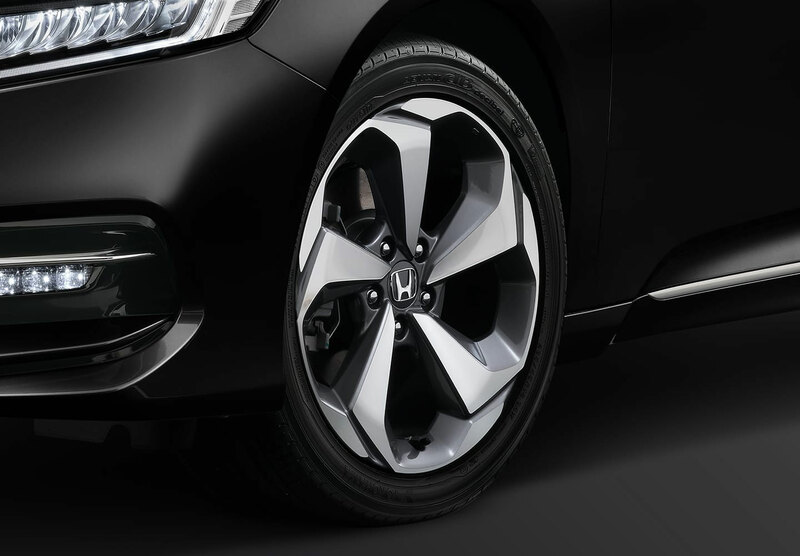 The Accord's tight, responsive handling is largely thanks to the use of high tensile steel and advanced suspension technology. 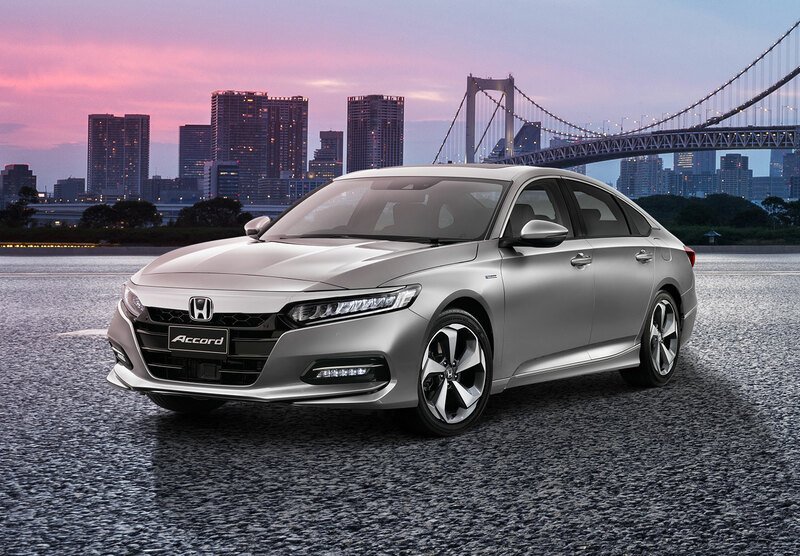 Combining MacPherson struts at the front and an independent multi-link suspension at the rear, the Accord offers intuitive control and greater stability. 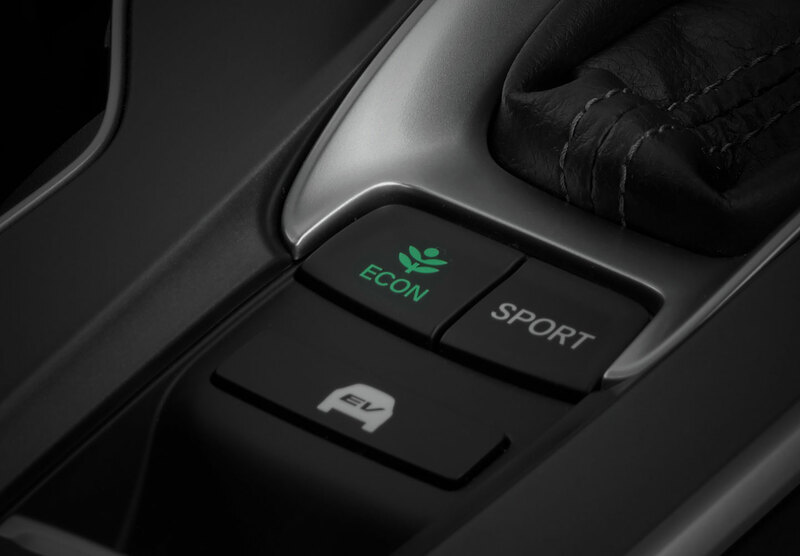 At the touch of a button, ECON Mode adjusts the performance of the engine, transmission and air conditioning to maximise fuel economy. Honda’s Eco Assist works as a visual coaching system, changing the colour of your speedometer to help you drive more efficiently. When you accelerate heavily, the speedometer will glow white. Drive in a smooth, controlled way and the display glows an encouraging green. Paddle shifters come standard, allowing you to downshift for some extra passing power or upshift into the next gear on the open highway, all without taking your hands off the wheel. The 2.4L engine features a smooth, precision engineered 5-speed automatic transmission, whilst the V6 model has a 6-speed automatic transmission, combining fuel efficiency and a smooth operating system. Both come with a responsive 'Sport' mode for more performance-oriented driving. 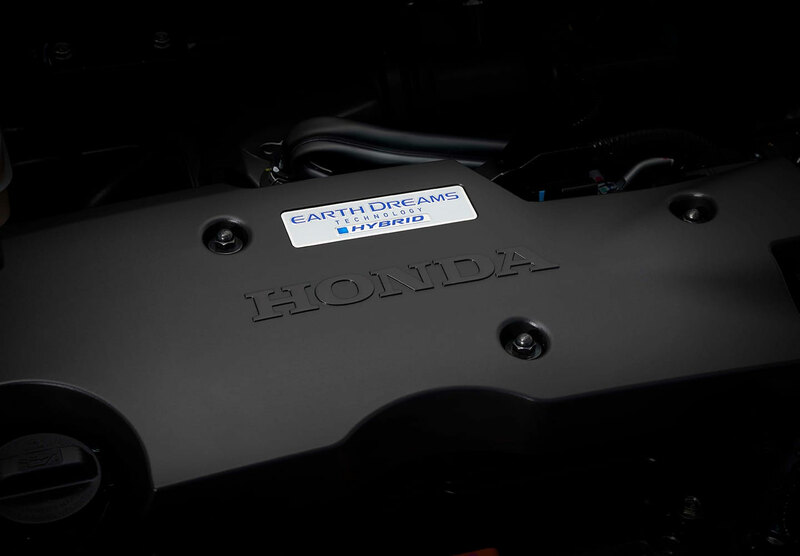 Power, refinement and fuel efficiency are the hallmarks of every Honda engine, and with the Accord, you have the choice of two – a commanding 2.4L 4 cylinder i-VTEC or the powerful 3.5L V6 i-VTEC offering formidable, yet efficient, performance. 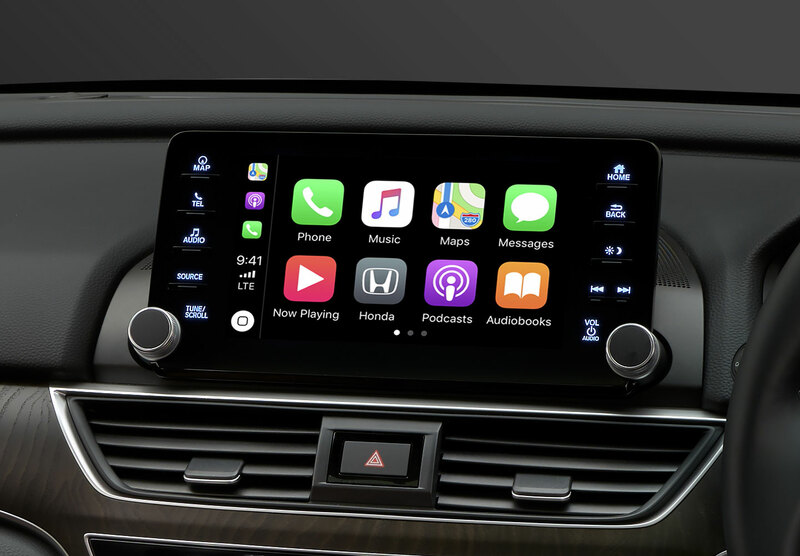 Android™ or iPhone® users can now seamlessly integrate their device to the Accord's touchscreen display. Get directions, make calls, send and receive messages, listen to music and even interact with some of your favorite apps. All while staying focused on the road. What's more, with access to Siri® Eyes Free or Google™ Voice Search, you can do much of it without ever having to take your hands off the steering wheel. All you have to do is ask. The Accord comes standard with Garmin® Satellite navigation and thanks to SUNA> live traffic updates, you'll always know how the traffic situation is looking. Designed to minimise one of the most notorious blind spots, LaneWatch really has got your back. 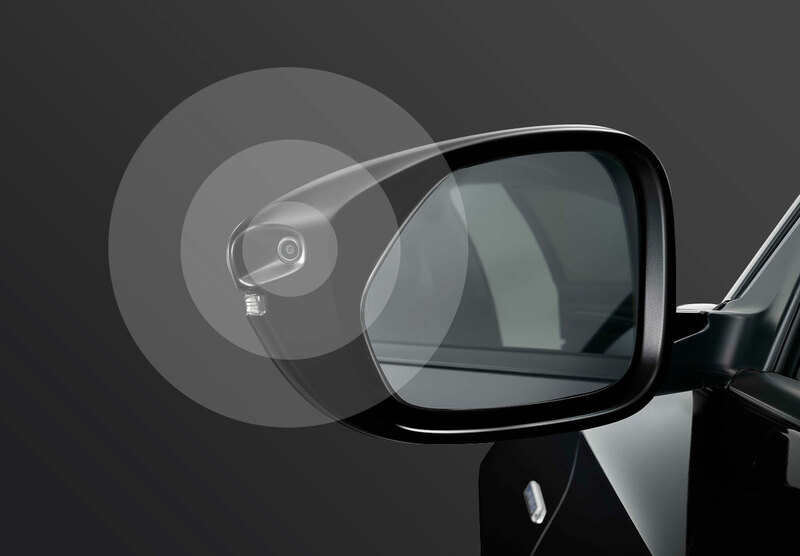 Mounted beneath your left hand door mirror, the blind spot camera projects vision onto the i-MID screen from the moment you signal left or push a button. Standard across the range. Once inside, you need only push the start button while pressing the brake pedal to start the engine. As long as the key fob is in your possession, the Accord will sense your approach and unlock the doors as soon as you touch the front handles or boot release. 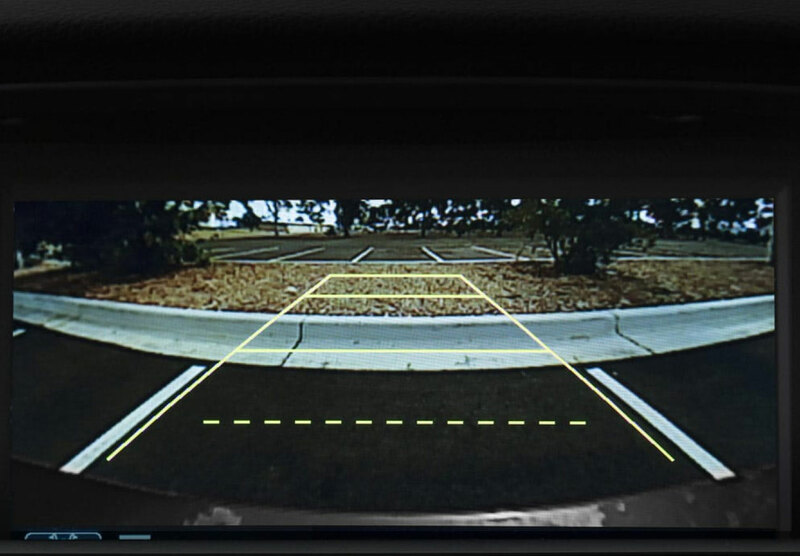 Shift into reverse and the multi-angle reversing camera automatically comes to life on the i-MID display. With up to three views to choose from and guidance lines to plot your projected path, it's your new best friend in the face of tight spots. Standard across the range. 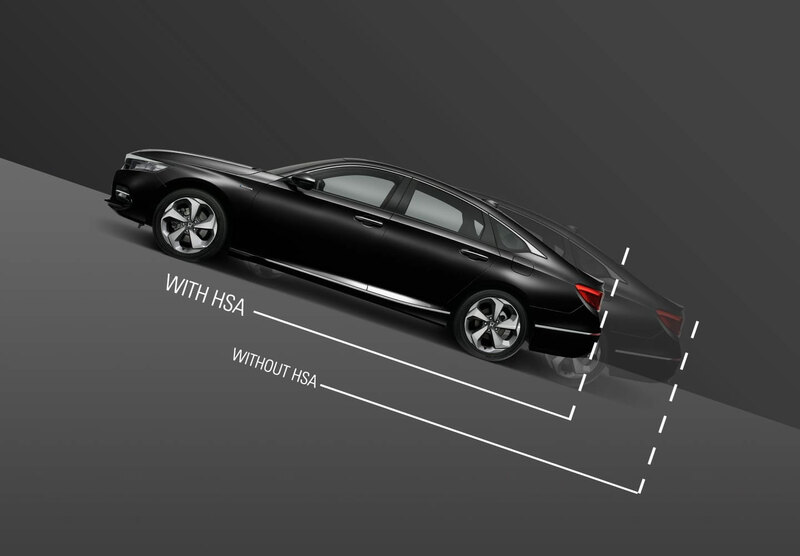 The Accord comes standard with an intelligent suite of driver assist technologies that are designed to help improve your situational awareness, and, in some cases, intervene to help avoid a collision or lessen its severity. 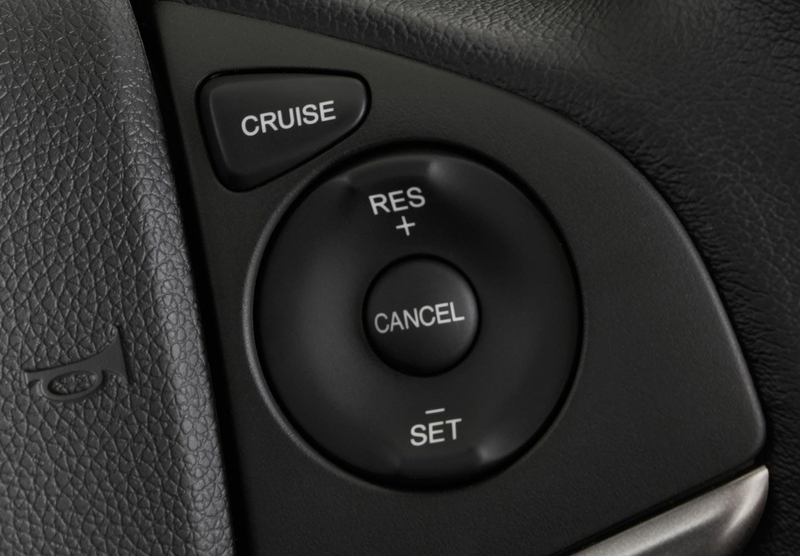 Building on the functionality of the conventional cruise control system, Adaptive Cruise Control helps maintains a consistent following distance between you and the car ahead. Takes the stress out of long drives by subtly reinforcing your steering to help keep you centred in your lane. Senses if you’re drifting away from the road without signalling and gently corrects your steering or braking to help keep you on track. Once, it was a courtesy to dim your high-beam headlights as other vehicles approached. Now your car does it for you. 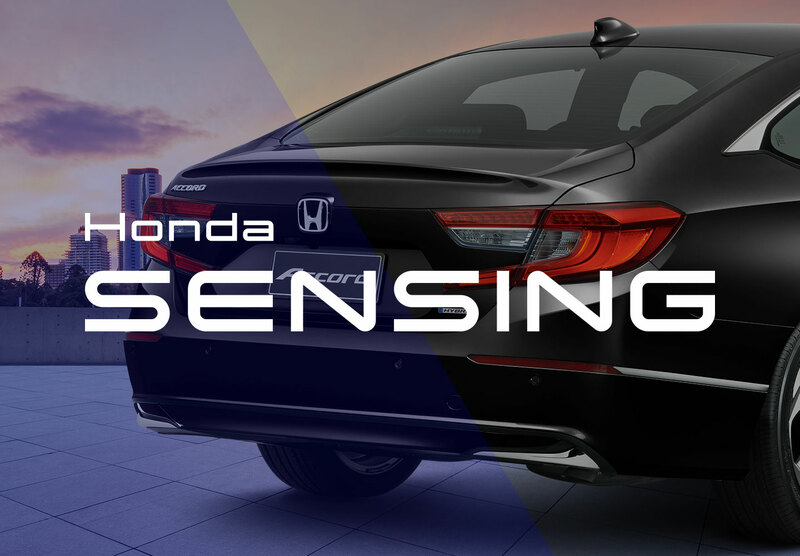 Thanks to the Accord’s high-tech image sensor, you can stop worrying and keep your focus on the road. 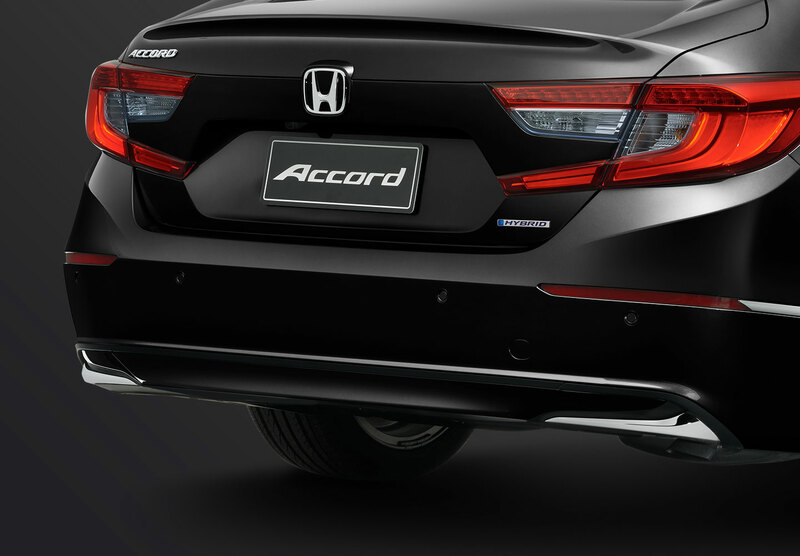 Slip in or out of tight spots with ease thanks to the Accord's front and rear parking sensors. With both a visual and audible alert, they'll let you know how much space exists between you and the nearest object. Hill Start Assist prevents ‘roll back’ when starting on an incline. 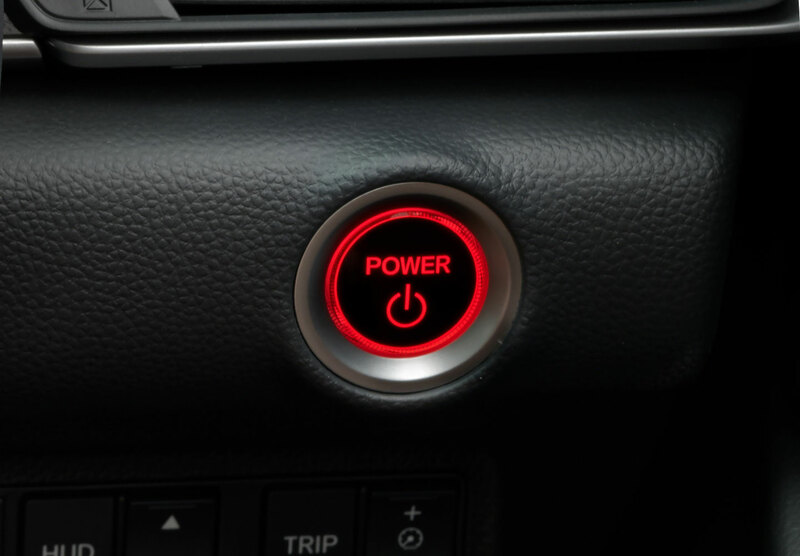 The system controls brake pressure, keeping the car stationary for a moment after you release the brake pedal. If an emergency situation forces you to brake heavily, drivers behind you need as much warning as possible. Emergency Stop Signal does just that, automatically flashing the hazard lights in the event of hard braking to reduce the chance of a rear-end collision. The Drive Away price shown is for an Accord in your chosen colour. It includes metallic/pearlescent paint (where applicable), 12 months registration, 12 months compulsory third party insurance (CTP), a recommended dealer delivery charge, stamp duty and administration charges. The drive away price shown is based on the vehicle being garaged in the postcode you entered, and owned by a 'rating one' driver aged 40 with a good driving record and may differ depending on your circumstances and (for applicable states), your choice of insurer. We strongly recommend that you confirm the final drive away price with your Honda dealer. ~ Leather appointed means some parts of the seats may contain non-leather materials.